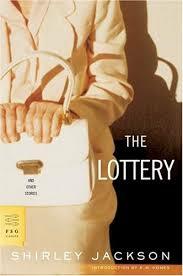 An essay on a The Lottery summary analyzes the novel by Shirley Jackson. A summary on The Lottery by Shirley Jackson can be custom written to be unique and only sold to you. Order an original essay that summarizes The Lottery by one of our literature professionals today. In “The Lottery,” author Shirley Jackson describes just a few moments of a single day in June in a small town of only a few hundred people. Children gather stones and the adults comment on everyday occurrences, like the weather and the work done for the upcoming planting season. An ominous black box is placed on a stool in the center of town as everyone watches; the papers inside are shuffled and moved about. After the required motions are done, the lottery is opened by Mr. Summers, who the reader learns has no wife or children to speak of. After a quick scan to ensure all the villagers were present, notes are made about who is drawing. Husbands are primarily responsible, but, in the absence of a husband, it can be done by a wife or a son who is of appropriate age. One by one, families’ names are called, and the appropriate representative removes a folded slip of paper from the box. After everyone has selected, the papers are opened simultaneously, and it is learned that Bill Hutchinson has selected the piece with the symbolic mark. His wife immediately begins protesting, but the townsfolk will have none of it. For the second stage of the lottery, each member of the family draws a piece of paper, from the older father to the youngest child, described as not old enough to understand that he is to take just one piece of paper. Tessie, the wife who protested her husband’s selection, is revealed to be holding the paper with the black dot on it, a sign that she is the one to be sacrificed. Everyone takes a stone, even little Davy, her son. Villagers begin throwing the rocks almost immediately, and the story closes with Mrs. Hutchinson protesting and town elders encouraging everyone to play their role in the annual ritual. Faces of Evil Research Papers examine a sample of an order placed on different quotes from pieces of literature and why it is important and the meaning behind it. Kate Chopin research papers discuss her major works like The Awakening, The Storm and The Story of an Hour. Edgar Allan Poe - A research paper biography on the life of the great American author and poet, Edgar Allan Poe, illustrate that it was a short and tumultuous life. Paper Masters writes custom essays on a The Lottery summary and analyzes the novel by Shirley Jackson.